People often ask, “What is Praline Mustard Glaze?” It is a wonderful blending of brown sugar, mustard, pecans, and spices that delights the palate. 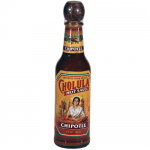 Try it on ham, chicken, or pork tenderloin. It is outstanding when poured over cream cheese or brie and served with crackers. Contains: Brown Sugar (Sugar, Molasses), Mustard (Vinegar, Water, Mustard Seed, Salt, Tumeric, Paprika), Water, Pecans, Spices and Natural Maple Flavor. Praline Sweet Potato Casserole 6 cooked sweet potatoes, peeled and mashed·1 cup sugar·2 eggs, beaten·½ stick margarine, melted·1/3 cup milk·5-6 Tbs. Dr. Pete’s Praline Mustard Glaze Mix all ingredients in bowl with electric beater. Pour into greased casserole dish. Bake for 30 minutes at 350 degrees. 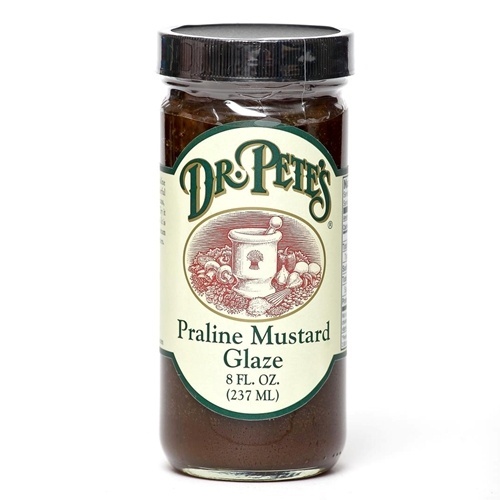 During last 5-7 minutes of cooking, drizzle additional Dr. Pete’s Praline Mustard Glaze over top of casserole and finish cooking. Serves 6-8. Optional topping: 3/4 cup chopped pecans tossed with brown sugar; put on top during last 5-7 minutes and then you drizzle with extra Praline Mustard Glaze! This recipe has a scrumptious flavor and souffle-like texture! Contains: Brown Sugar (Sugar, Molasses), Mustard (Vinegar, Water, Mustard Seed, Salt, Tumeric, Paprika), Water, Pecans, Spices and Natural Maple Flavor.